Investigators in Jackson County are getting ready to close the book on 7-year murder case. 56-year-old Matthew Cramton was found stabbed to death in his home on West Coler Street in Summit Township in January 2009. Thursday morning, the Jackson County Prosecutor's Office announced open murder charges have been filed against two people responsible for the crime. 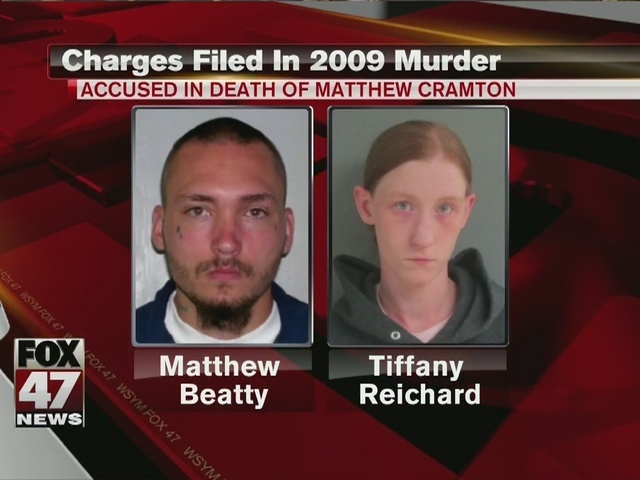 One of them is Matthew Beatty, who has spent the better part of the last 6 years behind bars for unrelated crimes. The other suspect being charged is Tiffany Reichard. The Jackson County Sheriff tells FOX 47 News Beatty was a person of interest in the crime almost immediately. Detectives were finally able to get enough leads to establish he was the guy and Beatty finally cooperated, leading to the charge of open murder. Sheriff Steven Rand believes Beatty and Reichard were boyfriend and girlfriend at the time, and the initial motive for the crime was robbery. There is no known connection between the suspects and Cramton, only that the suspects knew people in the neighborhood where Cramton lived. Cramton had no children and no family in the area and his body was discovered by a friend a couple days after he was stabbed to death. Reichard is expected to be arraigned for her role in the crime Thursday afternoon in Jackson County. Beatty's arraignment will happen at a later date, since he already behind bars serving time for crimes that include assault with a dangerous weapon, unlawfully driving away an automobile and prisoner possessing weapons.